General news of the day sort of stuff. Star Wars VII: The Force Awakens – a bit of speculation? It’s been a nice run but “after a journey of 400 years and 12 parsecs, I’m allowed a rest of 50 years”. I’ve put up a post every day for two months and now I’m taking a few days off. It won’t be fifty years, that’s for sure, but my review of The Imitation Game (which I watched last night) won’t be up until probably Thursday. Maybe tomorrow, but I’m going to the hockey game. Cheers and thanks my loyal readers! I’m not British, but the reburial of Richard III was lighting up my Twitter feed all week long. Twenty first-century Britain has enthusiastically embraced the story of the medieval king whose battle-scarred skeleton was found under a parking lot in Leicester in 2012. Carbon dating, bone analysis and DNA tests helped to confirm that the remains belonged to the long-lost king, who died at the Battle of Bosworth, near Leicester, in 1485. The victor, Henry Tudor, went on to reign as King Henry VII and founded the Tudor dynasty. Richard was buried, without a coffin, in a church that was later demolished and apparently paved over as a parking garage. King Richard III’s tomb is now a permanent feature in Leicester Cathedral. That’s not exactly how I remember the history happening though. In England at the end of the War of the Roses, we soon find out that the history we know is a Tudor fiction. In fact, Henry VII did not actually win the battle of Bosworth Field; he lost and though Richard III died in the battle, his nephew King Richard IV (who certainly was not smothered while still a boy in the Tower of London) reigned on for some years. How did Richard III really die? Prince Edmund, son of Richard IV, arrived late to the Battle of Bosworth Field and accidentally killed King Richard III, thinking he was stealing his horse. 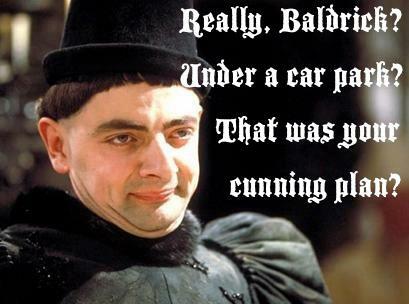 That’s right, I rewatched Blackadder. Rowan Atkinson is one of my favourite comedic talents, and though I didn’t find the first series (1983) as funny as series two (1986) or three (1987), it is still an incredibly good time. It could be argued that Atkinson grew to international fame because of Mr. Bean (1990) (a character he debuted in 1987 at Montreal’s Just For Laughs festival), but I have always loved and admired his verbal wit that to me he perfected during the Blackadder years. I had forgotten that Peter Cook played Richard III! 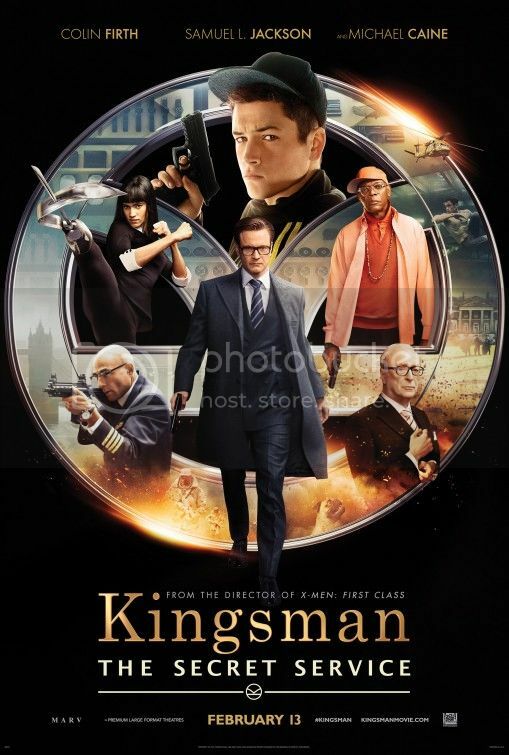 Kingsman: The Secret Service is best when it focuses on the superlative training of applicants for an elite agency. At one point new recruits are tied to tracks while an oncoming train is speeding toward them down the path. They will be released only if they divulge the true nature of their organization. The image is particularly apropos when describing the ridiculous way in which Kingsman ends. It’s a great film for most of its run time. I mean really wonderful. Then it goes completely “off the rails” in spectacular fashion. It’s that time again folks, time for the OHL Playoffs, the second season begins this Thursday, and my hometown team, the Niagara IceDogs are right in the thick of it. After a horrible beginning to the season, where even I had almost given up hope, the team managed to put together some winning streaks, most admirable was the 14 wins in a row at their new home, the brand new Meridian Centre. I’ve been to two games this year, and it is a beautiful new facility. Bigger and better than “The Jack” (the old Jack Gatecliff Arena that the Dogs had called home since 2007 when they moved to Niagara from Mississauga), the new building still has an intimate feel and a closeness to the ice and the action. The regular season ends with the IceDogs in fifth place in the Eastern Conference, which means their road to the OHL Championship and the Memorial Cup begins Friday as they play the fourth place Ottawa 67s who narrowly nabbed home ice advantage. Home ice will be a big factor in this series. The Erie Otters have the high scoring duo of Connor McDavid (most likely to be drafted first overall in this year’s NHL entry draft) and Dylan Strome, brother of former IceDog Captain and current New York Islander Ryan Strome. The Sault Ste. Marie Greyhounds finished first overall with 110 points, and the Oshawa Generals were two points behind them. All three of these teams are strong contenders. I haven’t watched many of the other teams’ games this year, but if I were to pick, I think the West final will come down to the Soo and Erie, and hope that the East will have Niagara in it. We’re a tough, scrappy team who are on a roll. Even in the loss to Erie today we managed to put up 7 goals. I know we’re the team that most teams don’t want to face right now, so our chances are pretty good, and if by some chance, we were to face whoever comes out of the West, I wouldn’t want to be in their skates. Go Dogs go. I guess what all this means is that I’ll be watching fewer movies (and therefore posting fewer reviews) when my team’s playing. I think the streak is over. I’ve got nothing to post about tonight, for the first time since the beginning of February. It was a nice run, but all good things must come to an end. You know I’m kind of relieved, the pressures of posting something everyday were starting to get to me, to consume me. It was almost to a point where I’d post anything just to keep it going…. kind of like this. I guess the streak lives and controls me for another day. Nothing. While the month is filled with sequels like Furious 7 and Paul Blart Mall Cop 2, I haven’t seen any of those previous movies. The only ones that looks interesting to me are Ex Machina, and Kill Me Three Times. But it also looks like I’ll be saving my movie dollars and checking them out when they hit video. Kill Me Three Times likely won’t play in my area, and while Ex Machina intrigues me I’ll pass for now. Even though I was a little disappointed by the first one, I will go see Avengers: Age of Ultron in theatres. I am still a sucker for the super hero movies, but we all know the one I’m waiting for it Doctor Strange next year. Mad Max: Fury Road looks pretty good too, and I may be able to find a few friends who want to see it. Though these days on those rare occasions that I do go to the theatre, I usually go alone. Spy looks like it could be a lot of fun too, but it screams “rental” all over it to me. It does look a little less formulaic than most of Melissa McCarthy’s comedies, and I love Jason Statham movies. Jurassic World. This is one that should probably be seen on the big screen. I watched the first Transformers movie at home, on DVD and was rather unimpressed by the effects. I don’t want to repeat that disappointment. Transporter Refueled. A reboot of the Transporter franchise without Jason Statham and apparently without Luc Besson. Repeat after me: “rental”. Ted 2. I had no interest in seeing Ted, so this one’s a big pass. As the Marvel Cinematic Universe continues to expand, we get a double dose this summer with Ant-Man following up on the events of Avengers 2. Ant-Man is an unusual super hero, and might not have the biggest fan base, but they took a risk on Guardians of the Galaxy last year that paid off huge. With Michael Douglas and Paul Rudd, the film will offer credible acting and the opportunity for a lot of humour. Look for the effects to be incredible too. Mr. Holmes. You know I’m dying to see this one! Ian McKellan as an aged Sherlock Holmes reminiscing and revisiting his “last” case. A little surprising, but this is really the “blockbuster” that I want to see most this year. Fantastic Four is a reboot but still not done by the MCU. I think that says home video to me, after I shelled out $20 to be disappointed by Fox’s previous two FF ventures. Though, if I hear good things from the right people, I may reconsider. Masterminds could have potential to be funny, but again, I’ll watch that alone at home. I don’t like watching comedies in the theatres, because I usually end up sitting by people who laugh at the wrong parts. I saw the Man From U.N.C.L.E. trailer and thought that the latest Guy Ritchie film looked pretty good, and if I were a more social person, I’d maybe go to theatres to see it, but again it’s probably a rental. Remember, I do get my movie rentals for free from work, so it’s not just that I don’t like to see films with others. Yes, I’m thinking of those kids who kicked my seat and barely shut up during Kingsman on Sunday. Man From U.N.C.L.E. would probably be right up their alley. That’s about it for the summer, of course if we wait until November I may consider Spectre, which would be the first Bond film I’ve seen in theatres since Tomorrow Never Dies; and in December, there’s a little film coming out that I don’t know if people have heard about: Star Wars VII. 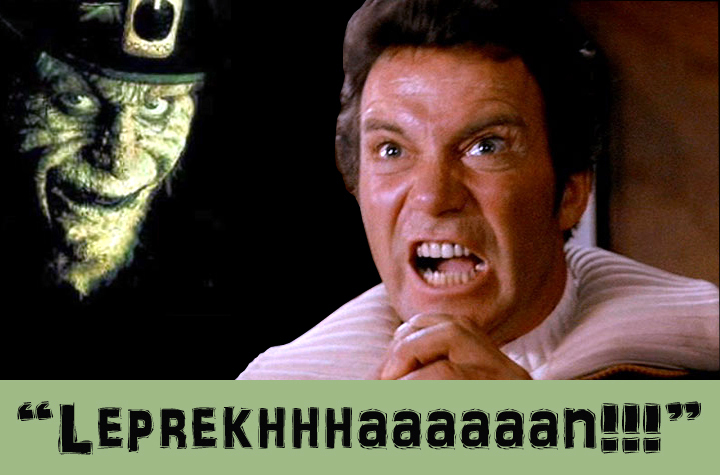 St. Patrick’s Day movies anyone? 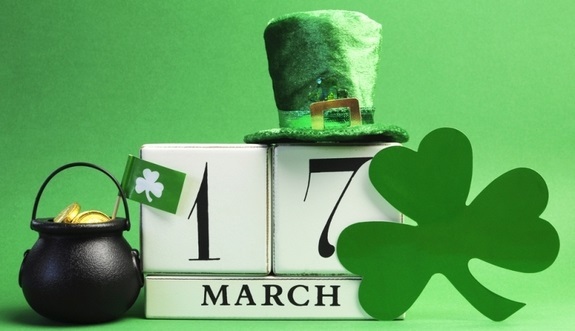 So when discussing movies representative of St. Patrick’s Day at work last week, we could only come up with eight, and seven of them were from the Leprechaun series…The other was Darby O’Gill and the Little People (with Albert Sharpe, Janet Munro, Sean Connery). Now there are lots of films that are Irish in nature, either being set in Ireland or having an Irish lead. There’s Boondock Saints, Boondock Saints II: All Saint’s Day….anyone notice that Billy Connolly and Sean Connery are Scottish? Should we just consider anything with Brendan Gleeson, Liam Neeson or Chris O’Dowd? Who knew the search for the perfect St. Patrick’s day film would be so difficult? Maybe I’ll just watch Indiana Jones and the Last Crusade. It’s got Sean Connery, which I assume is acceptable after Darby O’Gill, and Indy hates snakes too…. Well, it’s Pi Day again, and this year it was the most accurate Pi Day we’ll get for a hundred years. And yes, if you included the hours, minutes and seconds as well, we get pi to 9 decimals; 3.141592653 π. It is probably the nerdiest celebration around, with May 4th coming in a very close second. What do we do to celebrate Pi Day you ask? Well, it usually involves eating pie. I myself probably over do it, because I had shepherd’s pie for dinner, followed by a nice slice of pie for dessert. If I could have found an Eskimo Pie I would have had that as a snack this afternoon too. And if I meet up with my friends tonight at Bugsy’s, my local watering hole/pub/eating establishment, I’ll probably order a 4-slice pizza pie. Regular readers will know that I work in a video store, so we did a special today where select “pie” themed movies were on sale. New copies of any of the American Pie movies, Pi, Life of Pi, The Help, and Waitress were all $3.14 off, and the used copies were all $3.14 each. A few people took advantage of the sale, and hopefully they got the humour behind it. 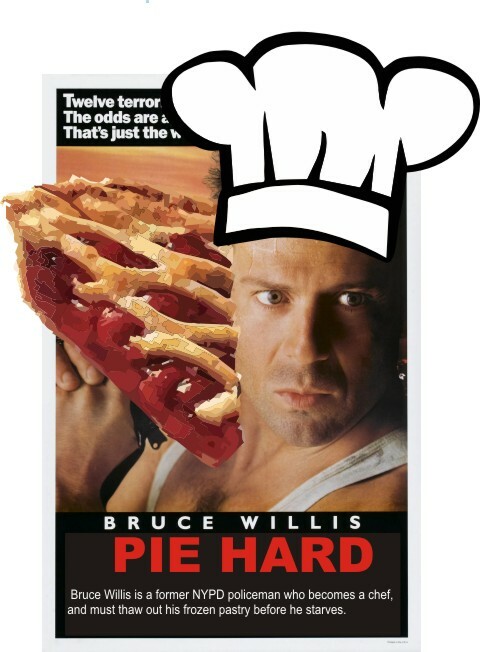 We also had a little fun on our Twitter feed where we joined in on the hashtag #ReplaceAMovieTitleWithPie. and of course Pie Hard. Aside from the movie references, Pi Day is also Albert Einstein’s birthday. Seems rather fitting that one of the most famous physicists of all time has such a mathematically significant birthday. Check out this link for some Einstein and Pi Day facts. √-1 2³ Σ π …. and it was delicious. I really don’t know why we celebrate Pi Day, it’s really irrational…okay that was two more jokes. Happy Pi Day everyone!